Image caption Police in New York have dubbed instances of phone theft as "Apple-picking"
New measures to curb soaring levels of mobile phone theft worldwide are to be tested in New York and San Francisco. Prosecutors will test measures on Apple's iPhone 5 and Samsung's Galaxy S4 to measure effectiveness against common tactics used by thieves. 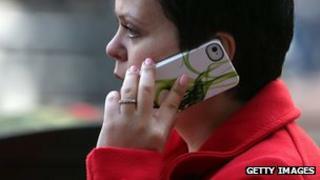 Various cities across the world have called on manufacturers to do more to deter phone theft. London Mayor Boris Johnson has written to firms saying they must "take this issue seriously". In a letter to Apple, Samsung, Google and other mobile makers, Mr Johnson wrote: "If we are to deter theft and help prevent crimes that victimise your customers and the residents and visitors to our city, we need meaningful engagement from business and a clear demonstration that your company is serious about your corporate responsibility to help solve this problem." Prosecutors in the US are following a similar line - last month meeting representatives from the technology firms to discuss the matter. They are calling for a "kill switch", a method of rendering a handset completely useless if it is stolen, rendering a theft pointless. Statistics from the US Federal Trade Commission suggest that almost one in three robberies nationwide involves the theft of a mobile phone. In New York, 40% of robberies are phone thefts - a crime so common it has been dubbed "Apple-picking" by police. London has seen a "troubling" rise in mobile phone theft, the mayor's office said, with 75% of all "theft from person" offences involving a phone - 10,000 handsets a month. The firms have offered theft solutions to help combat the problem. Apple's Activation Lock - which will be part of the next major iPhone and iPad software update - is to come under close scrutiny. Thieves will often deactivate a phone immediately to stop it being tracked after a theft. Activation Lock is designed to make it harder to then reactivate, as it requires the entry of the log-in details used to register the phone originally. For Samsung and other handsets, prosecutors, aided by security professionals, will be testing theft recovery system Lojack. "We are not going to take them at their word," the prosecutors in New York and San Francisco said in a joint statement. "Today we will assess the solutions they are proposing and see if they stand up to the tactics commonly employed by thieves."